In Greece, many things are much nicer on the islands than they are on the mainland, and these include the toilets. So let's hop on a Greek ferry into the Aegean Sea and check out the local plumbing! See my travel pages for lots of pictures and suggestions about travel to the Greek islands, including Santorini, Mykonos, Ios, Delos, Paros, Patmos, Rhodes, Naxos, and Samos. This page has modern Greek island toilets. See the Historical Toilets section of the site for several categories of Ancient Greek toilets, and the Mainland Greece page for toilets on the mainland. First, make sure that you can find the correct toilet! DEMOTIKES TOUALETES, or public toilets, it says. Then "WC". Let's start at the very beginning (and end) of the process. Here we see the headquarters of the Municipal Enterprise for Water and Sewage on the island of Mykonos. Mykonos is a mid-sized island, with an area of 85.5 square kilometers and a population of a little over 9,000, most of them living in the main town on the island's west coast. The main town on Mykonos is called Χορα or Hora in the usual Greek pattern of naming the primary town on an island "The Town". Most of the Hora is a pedestrian-only zone of narrow lanes. Beautiful Greek island architecture: smoothly curving walls painted a brilliant white, stone pathways, blue shutters and trim. But see my travel page for all that, we're focusing on the plumbing here! Let's look into these typical δημοτικες τουαλέτες (demotikes toualetes, or public toilets) on the island of Mykonos. You can see the entrance, and the toilet itself. It's a squat toilet, as the public toilets generally are in Greece. If you need a raised commode seat, have something to eat or drink in one of the numerous restaurants and bars and use theirs. 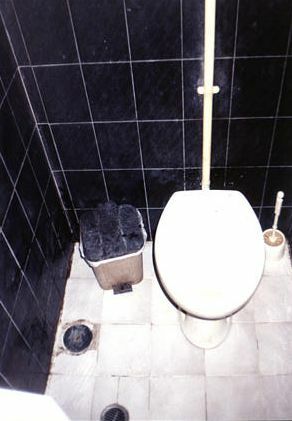 The toilet in the restaurant or bar might be a raised commode seat. If not, well, there are plenty of tavernas on most of the islands, try the next one! The Blu-Blu cafe / lounge / bar / Internet cafe is a good place on Mykonos to get on the net or transfer pictures from your camera to a USB stick. Or, as you see here, to use a raised commode style toilet and wash your hands. So you wonder what a typical bathroom looks like in a nice budget hotel on Mykonos? Here you go — this is the full setup at the Philippi Hotel, a very nice place to stay. It's at Kalogera 25 in Hora, +30-22890-22294, chriko@otenet.gr. Here's the bathroom at the Poseidon Hotel, overlooking the harbor town of Ormos on the island of Ios. Very clean! Notice how the floor and walls are ceramic tiles, and the floor has a central drain. This is a good bathroom design, it would be easy to keep this very clean. The water tanks at the Poseidon Hotel are slightly elevated. This provides slightly more vigorous flushing, again keeping things more clean. This scenic head is on board the F/B Artemis ferry en route from Ios to Santorini in the Aegean. We're on one of the upper decks on a ferry about 90 meters long and carrying up to 1,250 passengers and 74 cars, at speeds up to 18 knots. So, it's not one of the very largest, and certainly not one of the fastest, but this class of ferry provides a wonderful atmosphere for traveling between the islands out on an open deck watching the scenery slip past. And, if you need to make a quick visit to the head, you can keep track of the scenery! 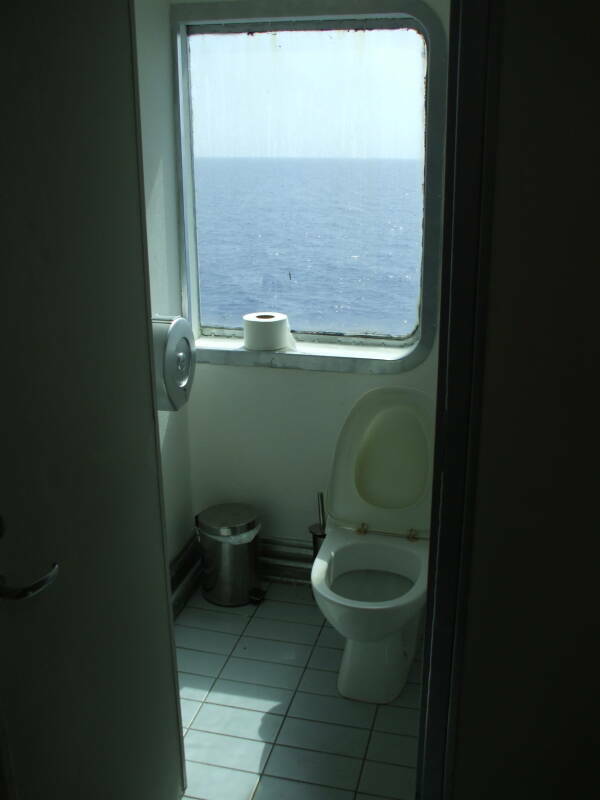 See the dedicated page of toilets on boats and ships for the explanation of why their toilets are called "heads". I had stayed at Petros Pension on Santorini on a previous trip, and so I got the luxury room on the top floor, the one with the kitchenette. And, of course, my own bathroom. 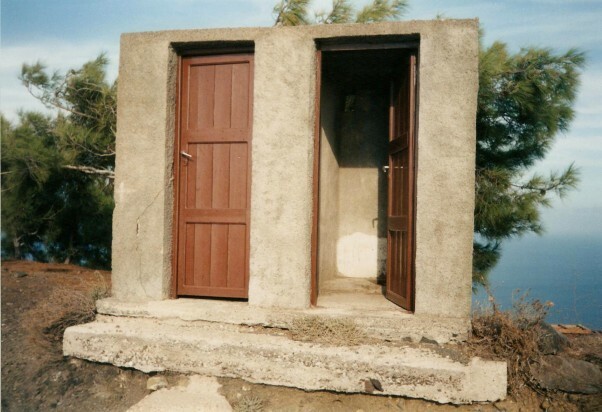 These are typical δημοτικες τουαλέτες (demotikes toualetes, or public toilets) on Santorini. The first one is just south of the main square in Fira, the main town on the island. Below you see the exterior of that toilet. The second squat toilet is just north of that main square. You are noticing the pattern, right? Municipal public squat toilets, and raised commode seats in many (but not all) tavernas. These two toilets are in the Ionian Domatia in Vathy town on the island of Samos. They're intense avacado models with forcibly removed seats and lids. See the Where is the Seat? page for an explanation of why toilet seats are removed or never installed in the first place in many countries. As for a domatia or δοματια, that is a small and simple lodging traditionally operated as a room rented by the homeowner. Here is something you find along the path following the ridgeline from the main town of Fira to Oia, on the island of Santorini. It's technically known as an Aegean mountaintop dual squatter. This one is in the Rodos Hostel, in the old city of Rodos, on the island of Rhodes. Seatless, as standard in Greece. It's very monochrome, black and white. Monochrome, there's a word of Greek origin. Mono- for one, and chrome, from chroma, for color. Here you see an overview and some detail of the ancient toilets at the Asclepion, on the island of Kos, in the south-eastern Aegean. Part of the Dodacanese chain, Kos was the home of Hippocrates (460-370 BC). A large medical school (at which Hippocrates taught) was located at the temple to the healing god Asclepius. Patients would come here to seek treatment, or to make offerings of thanksgiving after recuperation. Also see the New Testament toilets for more Greek examples from that time period.